CounselorMax® is the web application that works so well for homeownership counselors that it's earned its reputation as the industry's premier client management tool. Constantly updated and enhanced, CounselorMax improves workflow so that counselors can help make sustainable homeownership a reality for more clients than ever before. Always user-friendly. Now even more useful. To homeownership counselors across the country, CounselorMax is more than just a premier client management tool. It’s the web application built to take the busywork out of your workflow process. One of the most comprehensive systems of its kind, it automates education services, scheduling, data collection and more. In just a few clicks, reporting becomes more accurate and more compelling. Now more advanced, CounselorMax enables you to more efficiently and effectively complete tasks that you need to do, so you can accomplish what you truly want to do – to make sustainable homeownership a reality for your clients. Bring big administrative tasks down to size. Take productivity to the Max. Industry’s most comprehensive and user controlled reporting tool. Also includes Management reports for day to day operations and studying the efficacy of your organization. CounselorMax. As easy to learn as it is to use. Considering the hours of time and trouble CounselorMax can save homeownership counselors, its $595 annual subscription adds up to be an exceptional value. So user-friendly, CounselorMax's learning curve is short. Intuitive and thoughtfully designed, most homeownership counselors feel at home with the system in no time. Training can help you make the most of our web application, in the least amount of time. To learn more about live training options, visit the NeighborWorks Training Calendar. Stay in-the-know about the latest HUD updates and new functionality such as CounselorMax Management Reports by signing up for our online, instructor-led Webex training sessions. To view the calendar click on the Upcoming tab. Training sessions are archived. To view a prior topic, go to Recorded Sessions in the left navigation bar. Outstanding support: Learn more. Do more. Just as CounselorMax stands by the capabilities of our web application, we're always standing by should subscribers have any issues or questions. Discover all the ways that CounselorMax® helps you to stay on top of everything. If you ever need support, prompt technical assistance is never more than an email away at CounselorMaxSupport@nw.org. Take productivity to the Max. For minimal cost. CounselorMax Client management system, web application, HUD 9902 Certified. CounselorMax license costs are $595.00 per year for a base of 5 users (seats). Additional seats can be ordered for $150 per year per seat. Create a loan application (1003) right from your data. 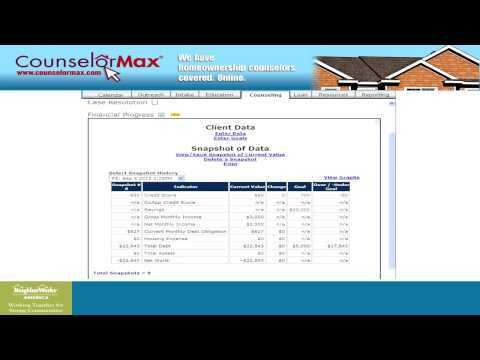 Upload any of your client’s documents right into the CounselorMax database (budgets, W-2’s, paystubs, bank statements, etc.). Loan modification packages, including a standard budget, can be transmitted electronically to the Hope LoanPort, an online portal for counselors and servicers to communicate with each other. Export a standard loan application form (1003) from the system for use by such tools as lender loan origination systems. ReportMax® - Aggregate your affiliate data into one report. ClientMax® - Allow your customers to engage with your agency via a secured portal. Take a Tour of the CounselorMax system in this video demonstration. Whether being utilized for pre-purchase counseling and education or loss mitigation, CounselorMax® is a cost-effective solution. Learn more about the in-depth features and tools that make CounselorMax the go-to choice.